The best electric fireplaces offers the ability to warm your living space on demand. They’re also versatile, and many are incredibly realistic. Whether you’re looking to supplement your central heating and air, or are seeking a way to warm up a tiny home or another type of small living space, the best electric fireplaces on the market today offer outstanding performance, interesting and innovative new features, and more. Here’s our list of the top electric fireplace makes and models on the market. 13 What Is an Electric Fireplace? Now that we’ve gotten an overview of the best electric fireplaces out there, let’s go a bit deeper into each model to see what they offer, and what sets each option apart from others on the list. The PuraFlame Alice is an interesting, thoroughly modern electric fireplace. Rather than a standalone unit, this fireplace is designed to be mounted within a recessed portion of a wall to give it a flat, seamless, modern look. However, the unit can also be suspended against a wall if a recess is not available. The fireplace can be hardwired, or it can be plugged into a conventional electric outlet, and you can use either a log set or a crystal bed to create the flame effect (uses LEDs, too). Choose from four different flame settings and colors, and choose from low or high heater function. Note that the thermostat can keep a 400-square foot room at 82-degrees F (lowest setting is 61-degrees F). This unit also features a handy countdown timer that can be set for a minimum of 30 minutes, or a maximum of nine hours depending on your heating needs. Note that the flame effect can be operated without the heater for year-round enjoyment. 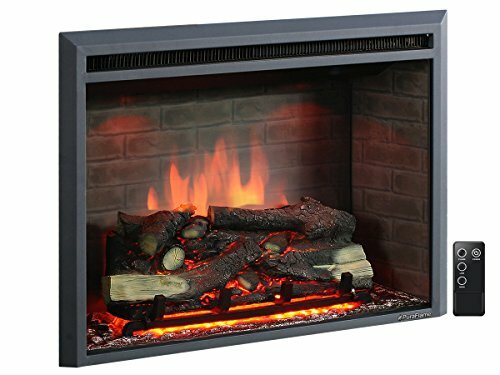 The Touchstone Sideline electric fireplace is a slim, modern creation that offers plenty of heating capabilities in a trim package. While the unit might measure 50 inches in length, it is only a few inches deep, allowing it to be installed in a wall recess for a smooth, modern look and feel. However, this unit can also be mounted directly to a wall, although it will project 5.5 inches into the room. 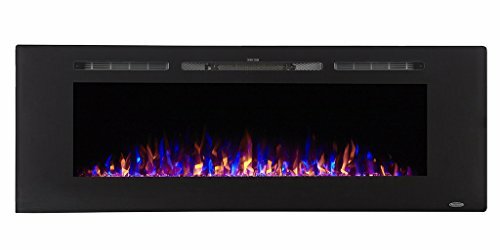 The flame effect is created with LEDs and a crystal bed, and features three different color options, as well as the ability to use the flame effect without turning on the heater so you can enjoy the realistic fire even during warmer weather. You can also choose from several brightness settings and operating modes, and you benefit from a remote control, a programmable thermostat, and a countdown timer. Note that the manufacturer suggests not installing this unit below a flat screen TV, as the heat emitted may damage the television. Going for a rustic look within your home? Whether you live in the heart of suburbia, or you enjoy rural life in a log cabin, the Duraflame DFI-5010-01 is a great choice for your needs. 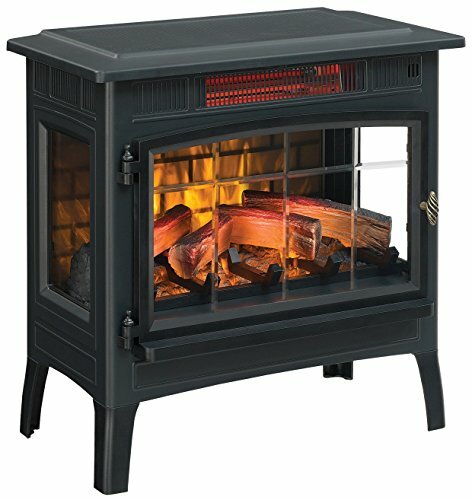 The body of the heater is built to resemble a wood-burning stove, with glass inserts in the door and both sides. The faux logs and LED technology allow you to enjoy 3D flame effects all year long, and the flames can be operated without the heat, as well. Note that the heater itself is located in the top of the stove, behind a laddered grille. Unlike many of the electric fireplaces on our list, this unit offers the ability to heat up to 1,000 square feet. It also gives you the option of using five different flame colors, adjustable brightness settings, and several blower speed options to fit your specific needs. The digital thermostat allows you to program the perfect temperature for your room, and the built-in overheat protection offers peace of mind. One of the most streamlined electric fireplaces on our list, the Touchstone 80001 is a marvel of modern design. It features a truly minimal design, with one-button on/off and easy mounting capabilities. Unlike other modern fireplaces on our list that are designed to be recessed into the wall, the 80001 is designed from the outset to be wall mounted and projects just a few inches into the room. It features faux logs and crystals, as well as LED technology for realistic flames, and it includes a handy timer that can be set for as little as 30 minutes, or as long as 7.5 hours (slightly less than some units we’ve covered). The glass screen stays cool to the touch, and the unit is capable of keeping a room that measures 400 square feet warm for hours at a time. It also features two heat settings (high and low), and the flame effect can be used without actually having to turn on the heater, so you can enjoy the romance of a fire even during the spring and summer months. Not looking for a wall-mounted fireplace, or an electric fireplace that fits inside your wall? 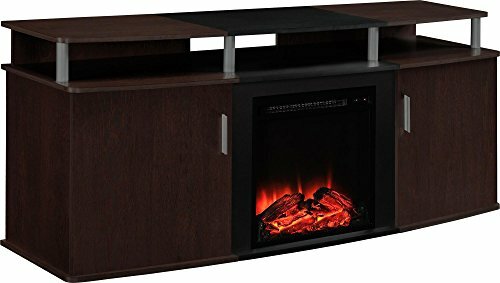 The Ameriwood Home Chicago Electric Fireplace TV Console may be exactly what you want. Sleek and modern, it combines shelving space, the ability to hold a flat screen TV, and cabinet space with a powerful electric heater. The screen features LED technology, so it always stays cool, and the console is capable of holding a TV that measures up to 50 inches and/or weighs 70 pounds. Below the TV mounting location, you’ll find two open shelves, ideal for storing your cable box, your Blu-ray or DVD player, a game console or two, or anything else you might like. The fireplace itself is flanked by two cabinets where you can store your movies, games, CDs, books, or anything else you might like. Note that the open shelves have a max weight capacity of 30 pounds each, and the adjustable shelves within the cabinets can hold up to 20 pounds each. The bottom shelves can hold 30 pounds. The fireplace measures just 18 inches in width, and can be used with or without the heat, so you can enjoy realistic flames anytime you like. Note that the heater is capable of warming a room of up to 400 square feet. It’s also worth noting that this unit arrives in need of assembly, and will require two people to lift. 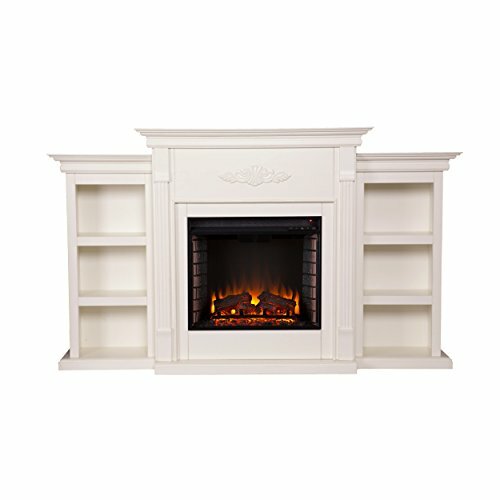 Looking for a way to put your aging fireplace to use without the need to actually burn wood and clean up ashes? 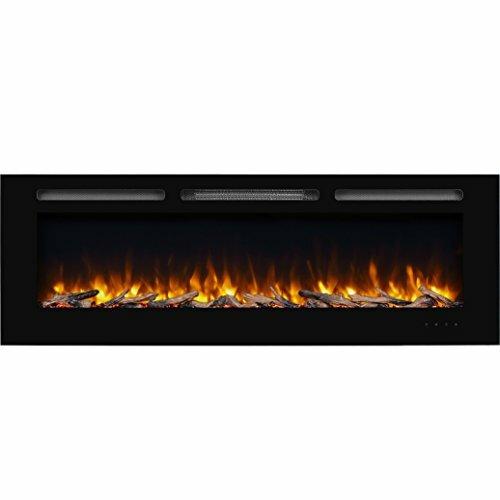 Look no further than the PuraFlame 33” Western Electric Fireplace Insert. This unit is designed to fit within your existing fireplace, and transform it into a source of electric heat. It can be used with brick fireplaces, as well as with decorative mantels and surrounds. The insert comes with faux logs and crystals to help recreate the look of a real fire, without the hassle or danger of real flames. The interior brick wall delivers a realistic appearance, and the three flame options allow you to customize the way your fireplace looks and feels to suit your mood or activity. This unit comes with an adjustable thermostat with a minimum of 60-degrees F and a maximum of 84-degrees F, so you’ll always be comfortable. It also ships with a remote control (batteries not included), and can heat a room of up to 400 square feet. One of the most elegant electric fireplaces on our list, the Southern Enterprises Tennyson features a timeless, classic design. It is available in a range of colors and finish options to match your home’s interior aesthetic, as well. The heater is powerful enough to warm a 400-square foot room and maintain that temperature for hours at a time. It also ships with a remote control (batteries not included), as well as an adjustable thermostat, faux logs, and a crystal ember bed. The fireplace features a glass front that remains cool to the touch at all times to ensure safety for children and pets. The fireplace is flanked on both sides by two six-shelf bookshelf units in a matching color/finish. The mantel over the fireplace can be used for displaying traditional knickknacks, but is also large and strong enough to support a flat screen TV up to 68 inches. Note that the flame action can be used without the heater, allowing you to enjoy the ambiance whenever you like. 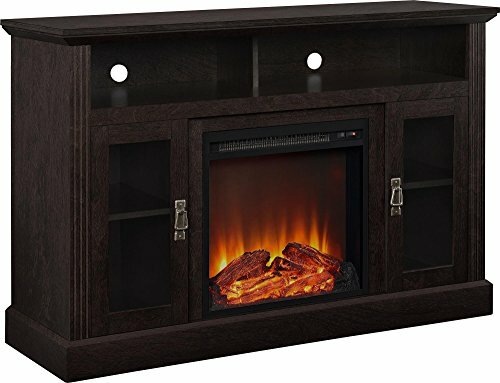 Sleek, modern, and available in cherry/black, gray, beige, or black, this modern electric fireplace combines an entertainment center with a compact space heater and LED screen. The fireplace itself measures 18 inches, and the heater built in can warm a room of up to 400 square feet. The screen itself features LED technology, so it is always cool to the touch. Note that there are multiple flame effects and colors that can be used, and the programmable thermostat ensures that you can set the temperature you prefer for the room. Note that the TV console can hold units of up to 70 inches, or 135 pounds. Beneath the top shelf are two open shelves for holding gaming consoles or DVD/Blu-ray players, both of which can hold 30 pounds. Two cabinets flank the fireplace, both with closable doors, and adjustable shelves capable of holding 10 pounds each. Note that this item needs assembly on delivery, and will require two people to lift. 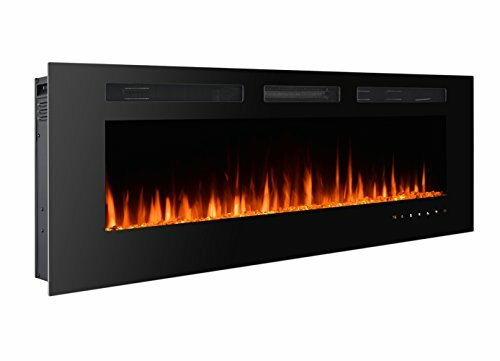 The final fireplace on our list, the 3GPlus 60” model is sleek and slim. It is designed to be mounted within a wall recess, and makes a great option for a home remodel or new home construction. However, if recessing the fireplace in your home is not an option, the unit can be mounted to the wall itself, although it will project outward several inches. The heat unit and blower vents are located on the front of the fireplace, so the back of the unit will remain cool and safe if mounted to the wall. Note that this unit features three flame color options, as well as the ability to automatically cycle through the colors. The LED screen is always cool to the touch, and the unit features overheat protection. The programmable thermostat lets you set your preferred temperature from 68-degrees F to 88-degrees F, and the unit also features a touchscreen for immediate control, a remote, a countdown timer, and more. Unlike the PuraFlame Alice we discussed above, the Best Choice Products 4 electric fireplace is designed to operate as a standalone heater. You simply move it where you want it, preferably against a wall, and then plug it in to warm the room. It features a sturdy mantel at the top, with faux columns to support it. The flame effect is created with LED technology, so the glass screen is always cool to the touch. 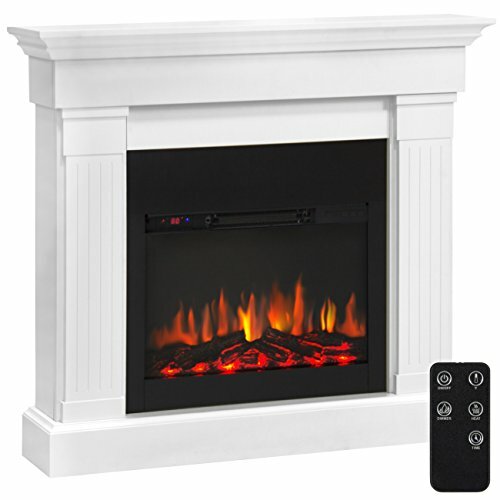 This electric fireplace also brings a host of convenient features to the table, including a programmable thermostat, a countdown timer, a remote control (batteries not included), and an adjustable brightness setting so you can create the perfect ambiance, whether you’re having a romantic dinner for two, enjoying family movie night, or getting together with friends. Note that this unit can also be operated without the heat, allowing you to enjoy the flame effect at any time of year. As you can see, whether you’re going for a rustic feel within your home, or you want something sleek and undeniably modern, there are options for just about every preference. Of course, if you have never purchased an electric fireplace in the past, you’ll want to know more about how to choose the best option for your personal needs. Home heating has changed dramatically over time. Fire, of course, has always been used. However, new technology has allowed us to move away from real fire, with its smoke, the need to clean ashes, the challenge and expense of sourcing and stacking firewood, and the danger of accidents. Gas is one option, but it can be costly, and requires retrofitting your fireplace. If don’t have a fireplace, gas can be tough to use without significant alterations to your home. An electric fireplace, on the other hand, offers convenience, financial savings, significant comfort, and considerable safety. When you strip away all the new technology, like LED displays and crystal ember beds, an electric fireplace is actually something most of us would recognize – a space heater. Sure, these heaters are a bit more advanced than the units you might remember from your childhood, but they’re still space heaters, and they work on the same principles. You plug the heater into an outlet (in most cases – hardwiring may be necessary depending on the make and model), and then turn the heater on. Resistance to the flow of electrons causes the heating elements to warm up, producing heat. A blower then pushes heated air out of the heater, and into the room, keeping you comfortable. Of course, electric fireplaces are much more than just glorified space heaters. They feature a host of advanced technology designed to keep you safer, more comfortable, and to deliver far more enjoyment than you would ever have gotten from yesterday’s space heaters. Depending on the make and model you purchase, electric fireplaces can deliver a host of benefits, particularly when you compare them to older heating options, such as wood-burning fireplaces, or old-style space heaters. Cost: One of the most important benefits here is the cost. You’ll find electric fireplaces available for far less than what it would cost for most other types of heating, including the installation of a new central heating and air system, or the construction of a traditional fireplace. They’re also less costly to operate over time, particularly when combined with LED technology. Mess: With a traditional fireplace, there’s a lot of mess. Burning wood creates ashes, which must be shoveled out and then disposed of. Embers can burst, sending ashes into your living room, and even burning your carpeting. With electric fireplaces, you have none of that mess – just simple enjoyment and reliable heating. Zone Heating: Zone heating is a concept that focuses on heating the areas of the home that you’re using at the time in order to save money on your energy bill. By turning off your central heating system and using an electric fireplace, you can save over trying to warm the entire home when you’re using just one room. Safety: Traditional fireplaces can be very dangerous. There’s the threat of a chimney fire, of embers igniting carpeting or catching drapes on fire, and more. You also have to worry about children and pets coming into contact with an open flame, or a heated metal surface. There’s also the danger of smoke production. With electric fireplaces, you have none of those worries. LED technology ensures that the screen is always cool to the touch, and there is no actual flame to worry about. Customization: Unlike traditional fireplaces, electric fireplaces can help you achieve the custom look you want within your home for less money. You can choose from TV console-style fireplaces, standalone options, inserts and more to get the look and feel that you want. When choosing an electric fireplace, one of the critical considerations that you will need to make revolves around heat production, particularly if you live in an area where it can get dangerously cold, or if you will be relying on your fireplace for a significant portion of your heating. Always check the heat output (measured in BTUs, or British thermal units), and compare the maximum square footage that the heater is capable of warming. Many units max out around 400 square feet, which is the size of the average family room, but some of them offer much more capabilities and can heat up to 1,000 square feet. Not sure how many square feet you’re trying to heat? Just get the dimensions of your room – multiply the length of the room by its width and you’ll have the square footage. For instance, if a room is 15 feet by 15 feet, then it covers 225 square feet. Now that we’ve explored some of the benefits of electric fireplaces, it’s time to discuss the types available. Each type has specific use cases, and will be a better fit for particular homes. Wall mountable electric fireplaces are the newest evolution of this technology. They are designed to be mounted against a wall, or they can be mounted within a recess in a wall. These fireplaces offer sleek, modern design, and are often very wide (think 50 or 60 inches). However, they’re usually only five or six inches thick, meaning that even if you mount them directly to the wall, they are still very slim. Inserts are designed to take up the empty space within your traditional fireplace. For instance, they would go where your gas logs are now, or where you burn wood if you have a wood-burning fireplace. Inserts can be modern or rustic, and can take any number of forms, from stove-like designs to open designs, but they all need to be mounted within an existing fireplace (or built into a wall in the case of new construction/renovation). Freestanding electric fireplaces are perhaps the oldest examples of this technology. They can be placed anywhere you like, and simply plug into a wall outlet. Many of them are designed to be placed near a wall to mimic the look of a traditional fireplace. They can also be found in a very broad range of sizes, from compact to very large. This is technically a subset of the freestanding category, but there has been so much interest in them recently that they deserve their own mention. These units are freestanding, and are usually designed to look like a traditional fireplace, or like an entertainment center. The mantel can hold items for display, or television sets. They also usually feature a combination of open shelves and cabinets so you can install things like DVD and Blu-ray players, or gaming consoles, and also store your movies, books and music. As you can see, there is a type of electric fireplace that’s ideal for just about any need. Whether you’re looking for a way to add heat and romance to your bedroom, to provide a more relaxing ambience in your family room, or a way to warm up your entertainment room, electric fireplaces can do the trick. However, in addition to the types of fireplace available, you also need to know a bit more about the most important features. Today’s electric fireplaces come equipped with a host of features that offer convenience and enjoyment, as well as those that offer improved ease of use. You’ll want to consider whether these features are available on the units you’re contemplating before you make a purchase decision. Timer: A timer is a handy feature to have, as it allows you to set the duration of operation for your fireplace. For instance, if you are using the fireplace for heating a bedroom, you could set the timer to turn off the fireplace when you wake up in the morning. Thermostat: A programmable thermostat is a very nice feature to have, as it helps to ensure that the room is always the temperature you prefer. Many electric fireplaces offer thermostats that can be adjusted from the mid-60-degree F mark to the mid or high 80s. This allows you to stay comfortable at all times without having to constantly turn the heater on or off. Display: When choosing between electric fireplaces, you’ll want to consider the display type. Newer units offer LED screens, but older ones can use LCD technology. Some units combine LED displays with crystal ember beds and faux fire logs, as well. You also want to make sure that the display is always cool to the touch, particularly if children or pets will be nearby while the fireplace is in operation. Remote Control: Operability is a big consideration with electric fireplaces. Most offer a simple on/off switch for manual operation, but some include touchscreen controls, as well. However, most should come with a remote control that allows you to operate the heater from a distance. This ensures that you can turn the heat up or down, adjust the blower, change the flame color, adjust the thermostat’s setting, or turn on the countdown timer without having to get out of your seat. Fire without Heat: There’s something undeniably mesmerizing about the dance of fire. The ability to have fire without heat can transform your events during the spring and summer. Imagine adding the romance of dancing flames to a summertime date night in your living room, or the ambiance of natural flame with a springtime dinner party. Look for electric fireplaces that allow you to turn on the flame effects without actually having to use the heater. Multiple Color Options: Most electric fireplaces offer a number of flame color and effect options. These range from tall, orange flames to low, blue flames. Many models feature three different color settings, as well as a handful of effects to help you create the perfect ambience for your mood, activity, or setting. Overheat Protection: This one is not so much a usability feature as it is a safety consideration. Your electric fireplace produces heat. There is the chance of overheating, which could damage the fireplace, or even cause a fire. It’s vital that you choose an electric fireplace that offers overheat protection so that if the temperature should exceed the safe operating range of the unit, it will automatically turn off before it becomes a safety hazard. Testing and Ratings: Another important consideration, particularly when it comes to safety with electric fireplaces, is to ensure that they have been tested and rated by a respected authority. Both UL (Underwriters Laboratories) and CSA certification are hallmarks of quality testing. Electric fireplaces are safer, more convenient, and less expensive than traditional fireplaces. They also offer a host of important features and functions, and can be used to help you achieve not just warmth and comfort, but the ideal ambiance within your home. Of course, there’s no shortage of electric fireplace models on the market today. We’ve highlighted 10 of the best options out there, but there are plenty of others to choose from. Even if you don’t ultimately choose one of the top-rated electric fireplaces we’ve introduced within this guide, use the information contained here to help you make an informed decision.